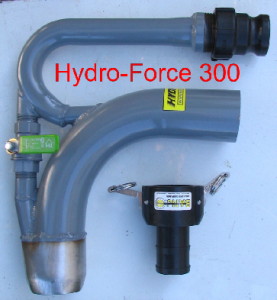 The Hydro-Force 250 can be used with almost any 2.5” dredge or highbanker, or it can be powered by an inexpensive trash pump. 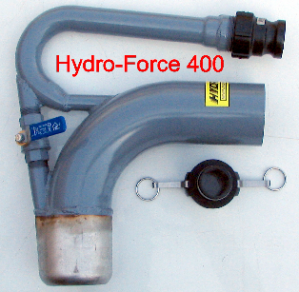 It only requires a single pressure hose, just like a conventional suction nozzle. The durable stainless steel nozzle tip is coned down to maximize suction and dramatically reduce plug-ups. 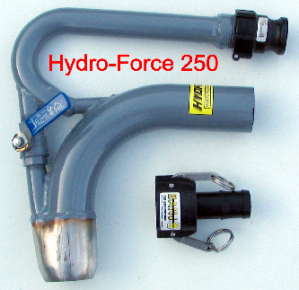 The Hydro-Force 250 can be used with almost any 2.5” dredge or highbanker, or it can be powered by an inexpensive trash pump. It only requires a single pressure hose, just like a conventional suction nozzle. The durable stainless steel nozzle tip is coned down to maximize suction and dramatically reduce plug-ups. In dry material, the unique 360 degree high pressure ring forces gravel and gold inward and upward into the suction stream. 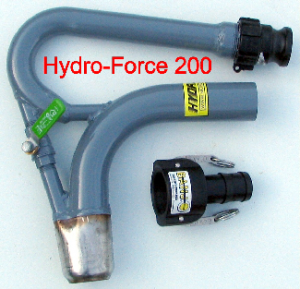 Price includes both male and female 1.5” Banjo Quick Connectors for your pressure hose.